An Iranian cleric looks at domestically built surface-to-surface missiles at a military show marking the 40th anniversary of Iran's Islamic Revolution that toppled the U.S.-backed shah, at Imam Khomeini Grand Mosque, in Tehran, Iran, Feb. 3, 2019. Iran dismissed European Union criticism of its missile program, regional policies and rights record on Tuesday, highlighting their increasingly testy relationship as both sides seek to salvage a troubled nuclear deal. Iran’s comments came a day after the bloc criticized the Islamic Republic's ballistic missile tests and expressed concern at Iran's role in growing Middle East tensions. The EU has promised to abide by a 2015 nuclear deal under which Iran agreed to limit its atomic work in exchange for sanctions relief, even after U.S. President Donald Trump abandoned the accord because it did not cover Iranian military activities. The EU has stepped up criticism of Iran's ballistic missiles program and its regional policies in a dual-track approach analysts say is designed to show Washington it is possible to contain Tehran while remaining inside the nuclear pact. The Iranian foreign ministry said on Tuesday Iran would never negotiate over its missile program, which it said was defensive and designed as a deterrent. "Clear threats against the Islamic Republic are not constructive, efficient or helpful, and they are not in line with regional security and the real interests of Europe," the foreign ministry said in a statement published on its website. 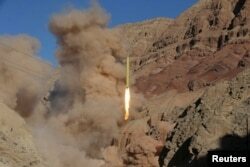 Iran has expanded its missile program in the last two decades, particularly its ballistic missiles, in defiance of the United States and despite concerns in Europe, especially France. As part of EU efforts to sustain the nuclear pact, Britain, France and Germany last week launched the Instrument In Support Of Trade Exchanges (INSTEX), a system to facilitate non-dollar trade with Iran and avoid U.S. sanctions. Iran's foreign ministry welcomed the new channel, but said it was "late and inadequate.” Iran would revise relations with Europe if it did not benefit economically from INSTEX, it said. The EU also urged Tehran to stop activities that deepened mistrust, including what it called Iranian assassination plots. France, Denmark and Netherlands have accused Iran of attacks against Iranian opposition figures and arrested suspects with links to Iranian embassies and intelligence ministry. Iran's foreign ministry rejected the EU warning: "Raising such baseless and hollow accusations while known terrorist and criminal groups are free in Europe, is not constructive at this stage and is in line with the goals of enemies who seek to undermine Iran’s relations with Europe." Iranian President Hassan Rouhani speaks as he submits next year's budget bill to parliament in Tehran, Iran, Dec. 25, 2018. Iran is celebrating the 40th anniversary of the 1979 Islamic Revolution, which toppled Shah Mohammad Reza Pahlavi, a secular monarch allied to the West. 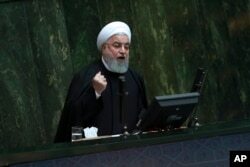 Striking a defiant tone in a speech broadcast live on state television on Tuesday, Iranian President Hassan Rouhani said: "The enemies should know that the great Iranian nation has stood by its goals and will not go back to 40 years ago." "Iran will not return to the era when it was under U.S. influence," Rouhani said.